Around this time a year ago, I was brought a pizza from my hometown favorite--Kraus' Pizza in Massillon, Ohio. Kraus' is distinct. The pepperoni curls up to hold a tasty amount of grease. The sausage is crumbled just right. The mushrooms, not those bland white kind, are a delight. The green peppers are diced just right. The crust is perfect. The sauce has the right balance of spice and sweet. "I should start a fan page on Facebook, " I declared! I ate that pizza before I thought of it. So, I decided to share my box instead. Using the photo of the box, I began a Facebook page. The owner's daughter actually thanked me for starting it one day after reading all the amazing comments. Today, as the fan page nears its one-year anniversary, the number of fans nears 4,000. The M.O. for the page is encouraging fans to share their pizza. 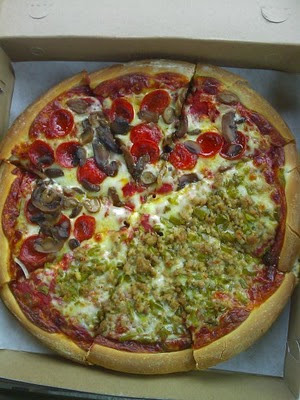 We encourage fans to post a photo of their Kraus' Pizza pizza for the world to see. Some fans even made a short video that added to the craze. No matter where you go in the World--and Facebook.com/KrausPizza fans come from more than 25 different countries and translate the page into 16 different languages--you always crave your hometown pizza. Like the box reads, "Das good!" Here's a link to the video some Kraus' Pizza fans at Warped Vision Studios produced. Das good!